Jeremy Love's Bayou was the first ongoing comic over at Zuda. I remember taking a look at it at the time and was surprised that the handful of pages were given an initial go over some of what I considered more promising ideas in the first contest. While the art was beautiful, I wasn't seeing very much story compared to many of the contestants' entries. Consequently, it fell off my radar. 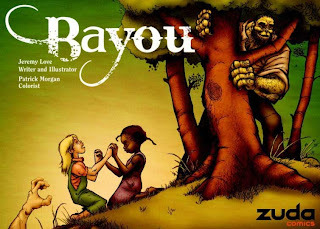 Bayou is Zuda's first webcomic to make it into print, and I got a chance to read through a review copy, thinking it might be worth a second look. And I'm very pleased to say it was! The story follows young Lee Wagstaff, who lives with her father near the swamps of Mississippi in the early 1930s. Her father runs into some trouble with the racist law enforcers, who wrongfully accuse him of killing a white girl. Lee heads out to find evidence to clear her father, and runs across a dim-witted "monster" by the name of Bayou living in the swamp. Bayou helps Lee recover from an accident, but the duo run afoul of "the Bossman" and opt to cement their friendship in a search of justice. Since the story's been available for free online for some time, it shouldn't take much for you to find excellent reviews of the story itself. It's got a slower pace than I think I was expecting initially -- especially in comparison to the other we've-only-got-eight-pages-to-make-an-impression Zuda comics -- but it's an excellent story, and the book has certainly convinced me to start reading the webcomic regularly. My only complaint is that I haven't read it before now. The question is -- how does the book differ from the online version, and is it worth dropping your $14.99 on? I was actually really curious to see how the transition in formats worked. Most webcomics I've seen that have later been printed have followed a standard print-comic sizing, which typically doesn't work as smoothly on horizontal monitors. But Zuda follows a horizontal format, more appropriate for online viewing. The book, not surprisingly, follows suite and is laid out more like a comic strip collection that a "traditional" graphic novel. There was absolutely no issues/problems with the unusual format and, I think, should give other webcomic creators prime incentive to stop formatting their strips as if they were for a traditional comic just because they'd like to see it printed sometime. On an interesting side-note, however, I can see that the pages have been cropped along the top and bottom slightly for the printed version. Certainly nothing that seems to impact the story, but the proportions are a little different than the online version. The other thing that I noticed right away was the coloring changes the tone from the online to the print version. Since a computer monitor is emitting light, it's naturally brighter than a sheet of paper. It should come as no surprise, then, that the colors online make the art "pop" moreso than the printed version. As something of a side-effect to that, Love's pencils are also more noticeable/discernible. By contrast, the printed version (on newsprint) has a more muted color palette. It hasn't been recolored; it's just that the paper has a tendency to not reflect as much color as a monitor can produce. While this does make some pages/panels a little muddier, it actually seems to suit the story -- in the swamps of Mississippi -- quite well. While there are some elements not dissimilar to works by L. Frank Baum, this is definitely NOT Oz, and probably shouldn't reflect the bright, technicolor approach many people associate with those stories. The color reflects the story better in print, I think, although I have to admit that I enjoy seeing Love's pencils more readily in the online version. certification are detailed here. The last TPB I bought from DC was published almost a year ago, so I don't know if this is new to DC trade paperback program or not. If it is new, it's wholly appropriate that it was started with comics stemming from their online arm, and I hope it's a program that is expanded throughout DC's entire line. All in all, I really enjoyed the book and will be looking forward to reading where Love takes Lee and Bayou next. I get the distinct impression that things are just starting to get interesting! Hey, thanks for the review. We're pretty proud of the book so I'm glad you liked it!